It's almost the end of "Tax Season", so we're going to be celebrating a bit and sharing tips, tricks, and advice to make things even easier next year. We'll be joined by the folks from @BlockAdvisors to share some of their professional advice as well as how they can help small business owners be more prepared to face financial challenges not just every spring - but throughout the year. Block Advisors is more than just a "one and done" tax service and they believe in establishing a dependable relationship with their clients to provide advice all year round for those of us who are self-employed. This of course includes tax preparation advice but also other aspects of your financial security that connect to taxes including payroll help, and support to ensure your identity is safe as well. Plus, we'll be giving away $50 dollar gift cards about every 20 minutes so make sure you are registered for a chance to win! This Twitter Party is hosted by #MenWhoBlog who will be giving away 2 $50 Gift Cards about every 20 minutes! Tweet this Promotional Tweet: "Join @MenWhoBlog #BlockAdvisors #TwitterParty! The Importance of a Year-Round Tax Advisor 4/12 at 11am ET #sweeps: http://bit.ly/25PYKRU"
Follow the official twitter accounts for the Host @MenWhoBlog as well as (optional) guests, and panelists. Add the URL to your Promotional Tweet in the comments below letting us know you're joining the Twitter Party. Participate in the #BlockAdvisors Twitter Party between the hours of 11 am - Noon Eastern Time (8-9 am PT) by contributing a minimum of one unique tweet responding to a question asked by the Host or comment made by Host, Co-Hosts, or Special Guests and using the hashtag #BlockAdvisors and #sweepstakes. Additional Tweets are appreciated but do not increase your chances of winning, only one entry per person will be accepted. Please click here to see official rules. Follow @MenWhoBlog for questions that will be presented as "Q1: What is your best advice? #BlockAdvisors"
Answer questions by responding in this format making sure to include the hashtag #BlockAdvisors, "A1: Get started early! #BlockAdvisors"
Make some new friends, ask @BlockAdvisors questions, and most importantly - have fun! Earlier this month, 10 bloggers embarked on a once in a lifetime adventure sponsored by Mazda. We camped inside of Joshua Tree National Park in California, explored desert roads, created some amazing photography, viewed the craters on the moon and cooked up some delicious campfire recipes. National Parks are one of our country's amazing treasures and for the most part they are designed to be explored by car. Now we want to have a conversation with you and share some of our stories as well as talk about where you are hoping to go this year. Road trips are an opportunity to explore this amazing country. It's more than just a way to get somewhere but rather an opportunity to see and experience things you simply can't when you only fly over them. Next week, we're headed into the California desert with 10 bloggers for a once in a lifetime opportunity to camp in Joshua Tree National Park, explore Historic RT 66, share stories around a campfire and see, do, eat, drink, and experience things you can't imagine unless you were there with us. This is something that you can do with your family too. With summer almost here, it's time to start planning your next road trip and we're going to share some tips on how to make those trips epic! Join #MenWhoBlog, along with special guest blogers as we talk about our favorite road trips and share excitement for our upcoming adventure exploring the California Desert. Thursday from 6 pm ET / 9 pm PT. 2) Follow @MenWhoBlog for questions that will be presented as "Q1: Where would you love to go on your next road trip? #DrivingMatters"
4) Answer questions by responding in this format making sure to include the hashtag #DrivingMatters, "A1: I'd love to go to the beach! #DrivingMatters"
5) Make some new friends, ask questions, and most importantly - have fun! One of the things I hate about traveling is missing sports games, but you can't always be home to watch them. With SlingBox, you'll be able to tap into your existing TV connection at home ... even watching it off your DVR and watch your favorite shows via tablet, phone, or laptop. If you're a sports fan then this is one device you won't want to miss and we're going to be giving one away during our Twitter Party! We're going to be talking about College Hoops and March Madness! This Twitter Party is hosted by #MenWhoBlog who will be giving away THREE SlingBox 500 units! 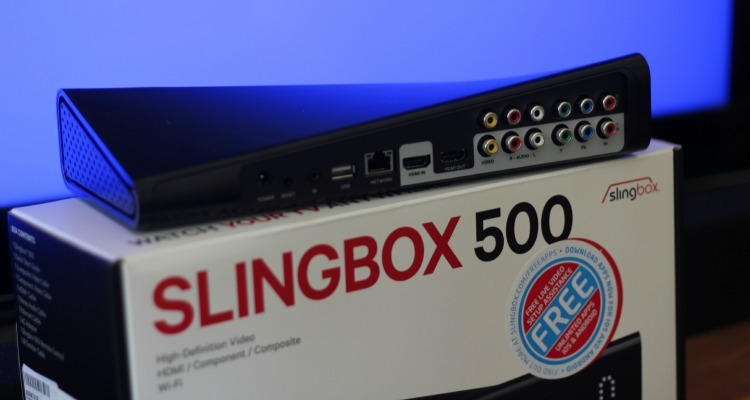 Tweet this Promotional Tweet: "Join the @MenWhoBlog #SlingBox500 #TwitterParty for a chance to win a SlingBox500! 3/10 at 9pm ET #sweeps RSVP here: http://bit.ly/1R4aprP"
Follow the official twitter accounts for host, guests, and panelists. Participate in the #SlingBox500 Twitter Party between the hours of 9 pm - 10 pm Eastern Time (6-7 pm PT) by contributing a unique tweet responding to a question asked by the Host or comment made by Host, Co-Hosts, or Special Guests and using the hashtag #SlingBox500 and #ad, #contest, #sweeps, #sweepstakes, #advertisement, or #sponsored. Additional Tweets are appreciated but do not increase your chances of winning, only one entry per person will be accepted. Winners will be chosen at random during the Twitter party at pre-determined times. @MenWhoBlog will announce the winner by sharing a Tweet tagging the winner's handle and including the link to the prize acceptance form. Selected party has until the end of the Twitter party to claim his or her prize by filling out the prize acceptance form. #MenWhoBlog is the Sponsor and Host of the giveaway. Sponsor, Host, and Co-Hosts, and Special Guests are not responsible for computer errors or typos and all decisions made by Sponsor and Host shall be final. Winners Twitter handles will be posted for 30 days on this web page. No purchase nescessary to win. Must RSVP to be eligable to win. Drawing will be random among qualified participants. No employees of SlingBox or any agencies, subsidiaries or sponsored participants involved in the promotion are eligible to win. No purchase necessary to win. Winner(s) will be announced during the twitter party. Host will follow up with prize delivery details. SlingBox makes no assurances or guarantees to the timeframe of delivery or condition of the prize. 2) Follow @MenWhoBlog for questions that will be presented as "Q1: Who are your rooting for? #SlingBox500"
4) Answer questions by responding in this format making sure to include the hashtag #SlingBox500, "A1: Let's go @UNCW SeaHawks! #SlingBox500"
5) Make some new friends, ask @SlingBox questions, and most importantly - have fun! Thursday from 2 pm ET / 11 am PT. Happy Mardi Gras 2016 Twitter Party! Mardi Gras (or Fat Tuesday) is here, the final day of the Carnival Season, and we're celebrating with a Twitter Party! Join us as we talk about our favorite parts of the season including parades, food, drinks, and friends. One of our members and a great friend, Phil from Gunaxin.com just returned from a Mardi Gras weekend in New Orleans and has two Captain Morgan Mardi Gras Prize Packs to give away during our Twitter Party! Tweet this Promotional Tweet: "Join the #MenWhoBlog #MardiGras #FatTuesday #TwitterParty to #WIN : 2/9 at 4PM ET / 1PM PT #sweeps RSVP here: http://bit.ly/1mp2s1R"
Participate in the #MenWhoBlog Twitter Party between the hours of 1 pm - 2 pm Pacific Time (4-5 pm ET) by contributing a unique tweet responding to a question asked by the Host or comment made by Host, Co-Hosts, or Special Guests and using the hashtag #MenWhoBlog. Additional Tweets are appreciated but do not increase your chances of winning, only one entry per person will be accepted. Please also follow the official twitter accounts for host, guests, and panelists. No purchase nescessary to win. Must RSVP to win. Drawing will be random among qualified participants. No employees of Captain Morgan or Gunaxin.com or any agencies, subsidiaries or sponsored participants involved in the promotion are eligible to win. No purchase necessary to win. Winner(s) will be announced during the twitter party. Gunaxin will follow up with prize delivery details. 2) Follow @MenWhoBlog for questions that will be presented as "Q1: What is your favorite part of Mardi Gras?" 4) Answer questions by responding in this format making sure to include the hashtag #MenWhoBlog, "A1: I love the music! #MenWhoBlog"
5) Make some new friends, ask @Gunaxin and @MenWhoBlog questions, and most importantly - have fun!